Another crafty event at the Tooting Tram and Social, this time organised by the good people at Handmade in Tooting. It includes workshops so that you can learn how to make Christmas gifts (& there'll still be time left in December to do it). 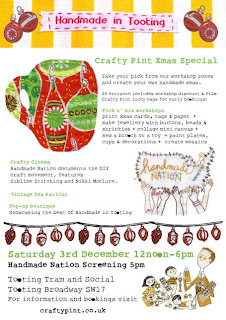 "Our December Crafty Pint will be a Handmade Christmas extravaganza with a pick n’ mix selection of workshops, a rare UK screening of Handmade Nation, vintage tea parlour and the Handmade in Tooting pop-up boutique. Crafty Pint will take over the Tooting Tram and Social for the day, setting up different workshop zones with our Crafty Pint tutors. Take your pick and spend the day, creating your own fabulous gifts all handmade by you in Tooting. More details about all the workshops are below. Entrance £5 includes a £5 discount off your first workshop and the film screening. You can pre-book or pay on the day. The first 30 advance bookings will win a Etsy Tote and Crafty Pint Lucky bag with all sorts of craft treats for you. Pre-paid bookings can also reserve their workshop places for the day."